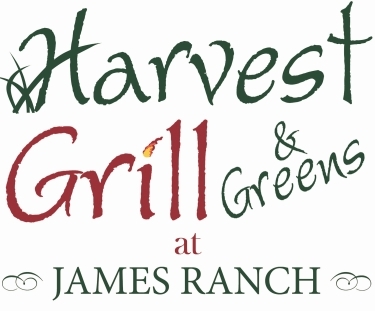 The Harvest Grill & Greens serves up our delicious, organic food harvested mostly from our ranch. The menu features fabulous hamburgers, steak sandwiches, gourmet cheese melts, fresh salads, and more made from our ranch's delicious meats, cheeses, and vegetables and other organic ingredients. What the families at James Ranch do not produce, we do our best to purchase from local, organic vendors who take pride in their quality products and ingredients. Call ahead (970) 676-1023 to find out what our seasonal special is today! Expect to be captivated by the beauty of the 400 acre ranch in the Animas River Valley. 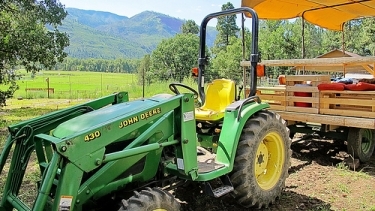 Enjoy a 2 1/2 hour tour on a tractor-pulled hay wagon or electric cart through the gardens and fields of James Ranch. See our Jersey milk cows, beef cattle, pigs, and chickens. Learn about our artisan cheese making and grass-based, sustainable agriculture. 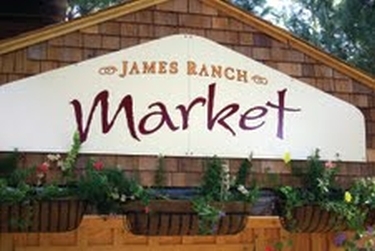 The James Ranch Market is located on Highway 550 North about 11 miles from Durango. Buy cheese, eggs, beef, pork, veggies, and more - all produced locally on our ranch. When you have the opportunity to buy your food directly from the source, "fresh and organic" takes on a whole new meaning. We're open 11am-7pm June through October so you can get your fresh eggs and morning harvested vegetables every weekday.